The Most Happening CES 2017 Announcements on Day 1! The Consumer Electronics Show(CES) is the world’s largest tech show, and is celebrating its 50th annual event this year at Las Vegas, Nevada. The show sees all large electronic manufacturers showing off their high-end smartphones, cameras, televisions, home appliances, drones and even smart electronics like watches and glasses etc. The event will be held from 5th January to 8th January, and the first day of the event has itself seen some interesting launches and display. From Asus launching world’s first smartphone with 8GB RAM to Samsung’s four-in-one washing machine/dryer, we have summarized the top picks from CES 2017. 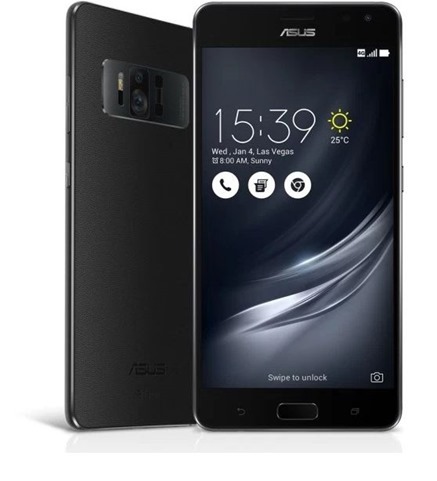 Asus has launched the world’s first smartphone with a monstrous 8GB RAM. It will also be the first smartphone to be Google Tango-enabled and Daydream-ready. Augmented reality allows users to play AR Games and use AR utilities, and has been built in close cooperation with Google. Apart from 8GB RAM, the smartphone comes with a three-camera system consisting of a 23MP Sony IMX318 main camera, a motion-tracking camera, and a depth-sensing camera. It also comes with Android Nougat 7.0 out of the box, so as to be able to support these features. The phone also comes with a front-facing 8MP camera. ZenFone AR sports a large 5.7-inch qHD Super AMOLED display, is powered by Qualcomm Snapdragon 821 chipset, massive 3,300 mAh battery and comes with a new five-magnet speaker to amplify the Daydream VR experience. If you don’t know already, Amazon’s artificial intelligence assistant ‘Alexa’ that powers Amazon Echo has become quite a thing at the CES 2017. Alexa is your personal assistant that can search the web for you, change music for you, read out emails and messages, set an alarm, control connected home appliances and do everything an AI assistant is supposed to. Lenovo has incorporated the same in their own Smart Assistant device. “After conducting a series of studies on consumers’ pain points and needs, the company designed the Lenovo Smart Assistant – a new digital personal assistant with Amazon Alexa cloud-based voice services” said Dilip Bhatia, Vice President of Global Marketing, User and Customer Experience at Lenovo. Interestingly, Lenovo’s Smart Assistant is an alternative to Amazon Echo, even though it uses the same AI. However, Amazon is deliberately allowing sharing of Alexa with other hardware manufacturers to increase the reach of this service. This assistant doubles up as a speaker and an assistant to help you with your daily activities. It is like having a personal assistant in your pocket or at home all the time. You can change the music, read the weather online and switch off unnecessary lighting at home with this device. The Lenovo Smart Assistant will be available from May 2017 for $129.99 (almost Rs 9,000). Amazon Echo is priced at around $160, so this device makes your money worth it. The earliest you can get the device would be in China, as India might not get it all together. Chromebooks have almost lost their existence because laptops are getting more powerful and cheaper. Especially with Windows 10 coming in, Google’s Chrome OS is losing its sheen. However, with Samsung’s Chromebook Plus & Pro models, Google wants to take on Microsoft Surface and Apple iPad. The two devices come with a stylus and support on-screen inking. The Verge said, these feature a 12.3-inch, 2400 x 1600 pixel LED display, 4GB of RAM, two USB Type-C ports, which support charging and 4K video output, a MicroSD card slot; and 32GB of internal storage. It has an all-metal chassis and weighs just under two and a half pounds and is just over half an inch thick when closed. The 360-degree hinge lets the device switch between laptop and tablet modes, much like many convertible Windows laptops available on the market. 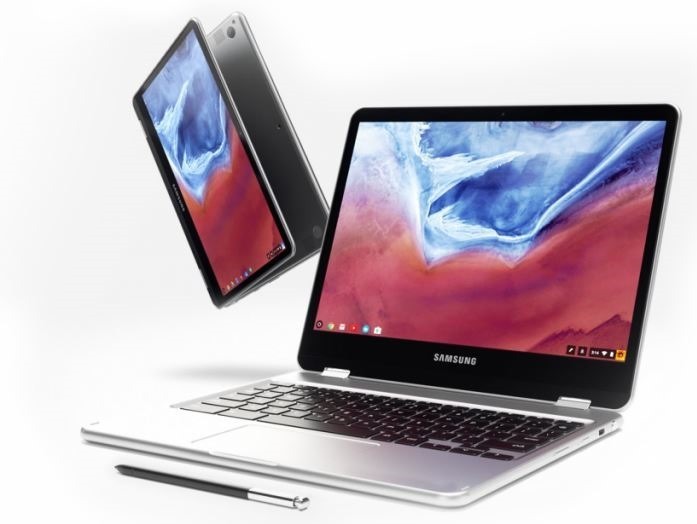 The only difference between the Chromebook Plus and Chromebook Pro, save for price, is the processor inside; the Plus has an ARM-based chip, while the Pro uses an Intel Core M3 processor. Samsung says that both models are rated for eight hours of battery life between charges. Just like the Samsung Galaxy Note series, these laptops come with a built-in stylus that can be used like the Apple Pencil. Considering Android’s apps and technology, the stylus on a Chromebook makes sense as well. Chromebook Plus will start at $449, while the pricing for Pro will be decided later on, and will be priced slightly higher. 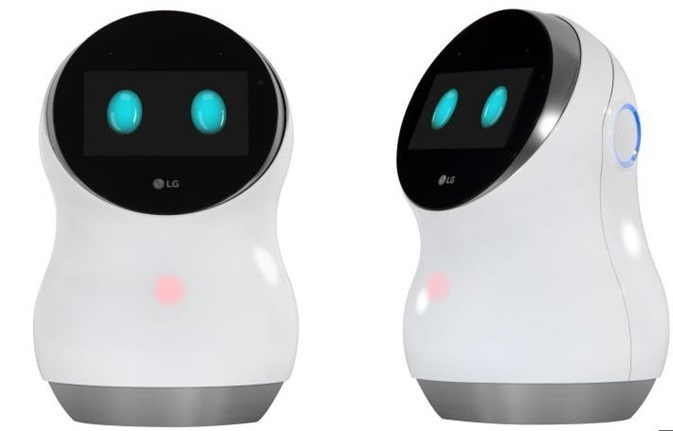 Just like Amazon Echo and Google Home, LG has announced its own speak & AI integrated device. It can connect to home appliances, tell you the weather, play a playlist for you and order groceries with ease. Taking inspiration from the movie Wall-E, the Hub Robot is a little white machine that has two glowing blue “eyes” on the front that make it look like a robot. 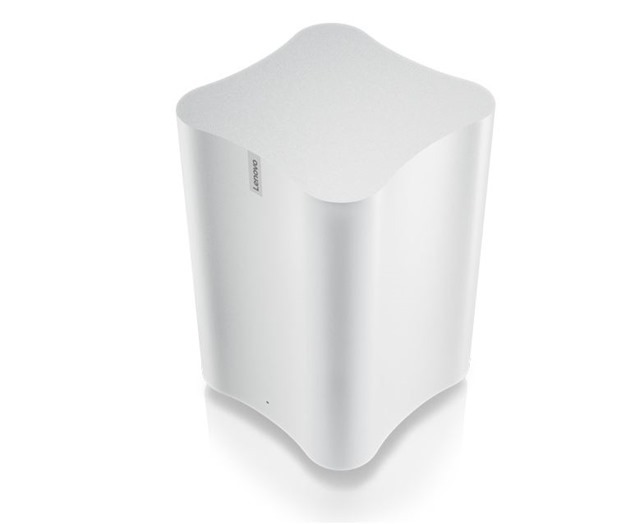 This electronic gadget also goes head-on with Lenovo’s Smart Assistant. LG has not released the pricing details of this device, but expect it to be priced somewhere around the $150 mark, as it goes on sale in about six months. Samsung calls it FlexWash and FlexDry laundry system and has announced it to be the most advanced washing machine of 2017. It is a set of two washing machines stacked next to each other, looking extremely futuristic. The two washing machines also provides the flexibility to the customer to wash two loads at once, so that your colour-releasing clothes can go in one while your whites go to the other. The machine also has an inbuilt dryer to completely dry your clothes before you iron them or use them directly. The best thing about this machine is that it can be controlled through an app that allows you to track progress and switch on different modes when needed. Samsung hasn’t announced any launch date or pricing details but the company has plans to launch it for the market very soon. One of the most important appliance at home that customers felt would not need anything smart in it. But CES 2017 has something else in store for us. LG has showcased a smart fridge with Amazon Alexa built right into it. Amazon Alexa allows users automatically adjust the fridge’s power settings, play music or even order groceries. Alexa gives the customers an option to do all this while making food in the kitchen, or watching the television etc. 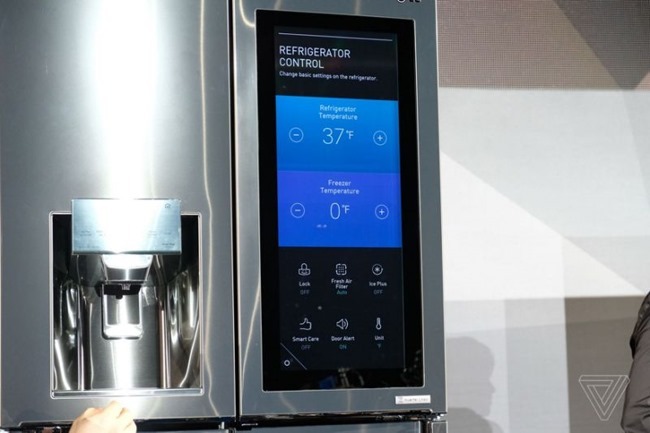 The fridge also comes with a 29-inch display with webOS integrated. You can browse the web, use apps and of course control everything through Alexa. On double tapping the display, it becomes transparent, allowing users to peek into the fridge. There is also a camera placed in the interior of the fridge to give you better control of its operation. The first day saw a lot of companies launching products with Amazon Alexa built-in. It is like Siri with additional capabilities. Huawei launched its smartphone Mate 9 with Alexa pre-included. Ford also has incorporated Alexa in its cars for users to better navigate their vehicles. Amazon Alexa was literally everywhere at CES 2017 – GE’s LED lamp ring has Alexa built-in, portable speakers from a variety of manufacturers, small and large, Whirlpool’s new washing machine, dryer, refrigerator etc, Linksys’ router system and Samsung’s vacuum machine. Self-driving cars were also displayed at CES 2017, however specifically Mercedes-Benz has been trying out a smart car that can drive on its own. Exactly like Tesla’s capabilities, this car from Mercedes-Benz will be cameras and sensors to drive on its own, but additionally will use Maps to navigate more accurately. Faraday Future also showed its prototype electric sports car but people were not impressed because they showed off some very intense figures for the car without a proper backing. SInce it is just a prototype, the car did not catch as much attention as it should have. Stay tuned for a quick roundup of Day 2 at CES 2017, as more and more companies launch more smart devices and focus on Internet of Things(IoT). "The Most Happening CES 2017 Announcements on Day 1! ", 5 out of 5 based on 3 ratings.